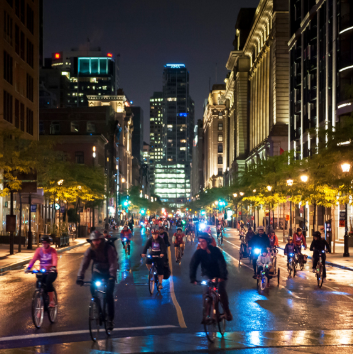 Join TBN this spring in Montreal for their biggest annual bike event - when thousands of cyclists pedal through the city night and day on car-free and stress-free roads. Cyclists will arrive Friday afternoon May 31, check into lodgings, and have time to ride the Friday night Tour La Nuit. Sunday is the big ride, Tour de L’lle and cyclists will have a choice of routes of various distances ranging from 25 to 100 kms. Saturday is a free day to explore Montreal or do more riding. The trip finishes Monday, June 3rd with checkout by 11 am. Getting to Montreal will be by car or train. We will try to connect people for car-pooling and sharing of gas costs. Registering for the GO Bike Festival - You will need to register for the rides you choose at the Go Bike Festival website http://www.velo.qc.ca/en/govelo/Go-bike-Montreal-festival. Registration for the festival will be online in mid-February. The cost of the Friday night ride is about $25 and about $30 for the 25-50 km ride on Sunday, longer distances cost a bit more. The TBN trip registration fee does not include the bike festival fees. Accommodations – We have reserved a penthouse apartment in a new building in the Le Plateau-Mont-Royal neighborhood in a trendy district, relatively close to the start of the bike ride on the Sunday morning. It has free WiFi, AC, rooftop hot tub and balcony. There are 4 bedrooms, 3 rooms with king size beds that can be converted into twin beds and 1 bedroom with bunkbeds. There is no parking on-site; there will be more information to come about parking. Bikes can be stored in the apartment or in the basement where they can be locked. Trip Price and registration –The maximum registration is 8 people if all rooms are shared. Due to limited space, this trip is restricted to TBN members. However, members may register for the non-members they may be sharing with. The total cost including all taxes is $440 CDN per person double occupancy for 3 nights accommodation, which includes 3 full breakfasts. Participants should make their own arrangements for sharing. TBN can also help arrange room sharing. Should someone want a room to themselves the trip cost is $700 CDN per person. Should we get demand for more spaces, we will try to reserve a second apartment in the same building. Please read the cancellation policy on the Overnight trips main page. Food – All breakfasts are included in the trip fee. Lunch and evening meals will be your choice with many restaurants in the area. For more information, please contact Vida at vaidavaitonis@gmail.com or Lora at lora.flanagan@gmail.com .